Recent release “Abigail Ashley and the Tedious Tea Party” from Page Publishing author T.B. Hackerman is a fun-filled short story about a not-so-typical girl named Abigail Ashley and her adventures in the odd woods behind her tiny house as she talks to living creatures. T.B. Hackerman is an aspiring writer who writes poetry, short stories, and songs, and a certified nursing assistant since 2005 who enjoys helping the disabled, the elderly, and the sick. She has completed her new book, “Abigail Ashley and the Tedious Tea Party”: an enthralling work about a young girl who lives with her mum and grandmum in a small house at a quaint village of Surrey, England, and the secrets that she reveals to readers through her adventures in the woods. Published by New York City-based Page Publishing, T.B. Hackerman’s new book is an engrossing short story about the encounter of Abigail Ashley and a ladybug named Lola, a mighty tree named Otis, the Busy Bee Sisters, Henry the hedgehog, Sal the snail, and Rox, the sly fox. They all gather for a fun tea party committee in the woods where they will witness Lola’s great transformation. 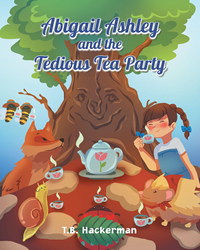 Readers who wish to experience this enlightening work can purchase“Abigail Ashley and the Tedious Tea Party” at bookstores everywhere, or online at the Apple iTunes store, Amazon, Google Play, or Barnes and Noble.